The town of 23,500 inhabitants is built around the mouth of Sió running out from Balaton; with its shore of 17 kilometres Siófok is the longest settlement of the Lake. Resort place of bustling life with heavy traffic, the number of its inhabitants is quintupled in summer. The Roman conquest reached the area of the current Siófok in the 1st century, the route from Sophianae (Pécs) via Tricciana (Sárvár) to Arrabona (Győr) had been passing through this place. The name Siófok is first mentioned in the document of foundation of the Benedictine Abbey of Tihany in 1055. After the Mohács defeat the town was taken by the Turkish around 1543; they built a fortification and a military port here. The region was liberated in 1688. At the time of Rákóczi's fight for freedom the famous Sió line of Bottyán Vak lied in this area, the final point of which was the fortification of Siófok. The fortress had been built on the place of the former Turkish fortification in accordance with the plans of the French military engineer, De la Riviere. In the 18th century the fine sand of Siófok was used for the purpose of dusting. The southern railways (1861) and a railway station (1863) were constructed in Siófok, and in 1863 the Sió lock was inaugurated here. The port was completed in 1864 and this way Siófok became a change-stop of guests of the famous Füred. The chapter of Veszprém commenced to divide the lands of Siófok into allotments in 1883, and so the current resort place started to be established. Owners of the first villas had primarily been painters. 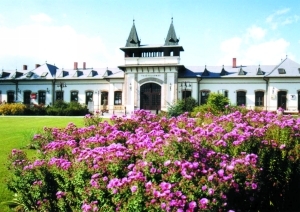 Siófok Balaton Bathing Co. was funded in 1891 under the management of Henrik Glatz. The right of bathing as well as the territory of 60 hectares required to the construction of parks and buildings had been purchased by the Corporation. Construction of larger hotels had commenced, too. The new resort place was opened in 1893, it received the name 'medicinal bath' at that time. The ship traffic at Balaton is the heaviest in the port of Siófok. Sió lock built together with the port which is used for the purpose of regulating the water-level of the river, is also an interesting sight of the city. The Meteorological Observatory is built westward to the port, directly on the lake-shore. The most rustic buildings of the resort area are erected around the junction of Batthyány and Mártírok street; our famous writers e.g. Mór Jókai, Gyula Krúdy and Frigyes Karinthy spent pleasant summer days there. 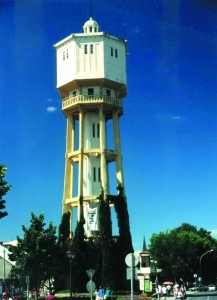 Water tower of 45 metres built in 1912 in the centre of the city. It is the symbol of Siófok. Cultural Centre of the South-Balaton Region and the Lord Mayor's Office stand in the neighbourhood, on Fő square. The Roman Catholic church in Fő street was built in 1903. The Evangelic church with wooden structure designed by Imre Makovecz, located in Oulu park, is a special sight of the town. Millennium Park in front of the railway station is decorated with the statue of Imre Kálmán made by Imre Varga which is erected in the Pavillion of Music. Museum of Imre Kálmán is established in the house where the king of operetta was born. Piano, scores and personal belongings of the composer can be found here in period atmosphere. Mineral Museum introducing the minerals of the Carpathian Hollow is the largest exhibition in this subject in Hungary (collection including 3,000 pieces). Exhibitions of the fine arts on the upper floor of the Museum of Imre Kálmán and of the Cultural Centre of South-Balaton Region. Festival, concerts, sports events and exhibitions in the town. Each year programmes start with the Whitsuntide Feast Opening the Summer Season comprising a procession, a ball and the election of the Beauty of Balaton. Siófok resort for artists also opens at that time. Golden Shell International Folklore Festival at the beginning of July. It is one of the largest summer programme for tourists. Besides the great entertainment, knowledge can be obtained about other people's art and habits during the Festival. Extraordinary series of programme are provided in July and August with historical, military and riding games introducing the art of fight of Hungarians from the age of Árpád's conquest of Hungary (mounted arching) till the 1848-49 fight for freedom (hussars). Besides the organ concerts given by famous organists, an organ course is held in the Roman Catholic church, too. The everlasting works of Imre Kálmán for the lovers of operetta in the Cultural Centre. Concerts on open-air stage and at the large beach for pop music fans. Great sports events of the town are the following: Hugarian Jumping Derby which is a three-day international riding competition and a cultural festival, too; Balaton Marathon and Balaton Supermarathon running competitions; Golden Shore Cup including five-man football, tennis, streetball and bowls. Töreki bog and a system of lakes consisting of eleven smaller lakes 4 km from the port, down to the Silver Shore of Széplak. Interesting environment completely differring from the one at Balaton region in this nature conservation area.